Sunday didn’t finish with a bang, but with a slow subtle throbbing headache. After spending the whole weekend designing and drawing, my eyes were spent, and sending another completed file out left me elated and yearning for a dream state. The completion of 2 new sticker designs was satisfying though, almost as much as placing the order. I spent 2 days, the first day working on half of the image of a new 1Spot sticker, and the 2nd day was spent finishing up the overall layout. The design for the new sticker is an adapted version of “Elevated,” the colorful profile picture I have posted on my artist page on Facebook. This incarnation is in black and white, and I ended up adding more elements to a section of the painting that I felt needed more work. However, an unfortunate side effect of the conversion of the iPhone painting to a TIFF image results in every flaw showing up in high quality. Thus the clean up process involves cleaning up lines; straightening, erasing, and filling. Very tedious work that starts grinding on the hands after a while, but a step I consider important in quality control. By Sunday afternoon, I had finished this laboring process and started working on another sticker design for myself. The design I used for this piece was “Bliss,” another iPhone painting, and fortunately, the larger details meant less clean up work for this sticker. Around 7 pm I had finally finished up both layouts and submitted them to the printer for final output. Which meant for me, I could finally eat something. Sometimes when I get too ingrained into a project and I’m looking at a deadline, I will forgo eating until the task is completed. That’s probably not the best way to fuel my creativity, but the meal is like a reward for a day’s work. After a late evening Ziindi/1Spot meeting, I was finally able to drift off into lala land and recharge. Aside from the weekend tasks I had assigned myself, I managed to check out the video game exhibit at the Phoenix Art Museum. The event was a great break from work and seeing all the old school consoles brought back many memories; mostly of the massive amount of hours spent gaming either on a console or on a pc/mac. Katja was kind enough to accept my open invitation via Facebook, so it was interesting hearing her experiences with gaming. We also toured the rest of the museum, and I think by far the most impressive installation was the black butterfly’s permeating the entrance. Overall a nice break to a working weekend, and after getting home and working on the 1Spot sticker a bit, I started sketching out a concept for another project that I have on the burner. 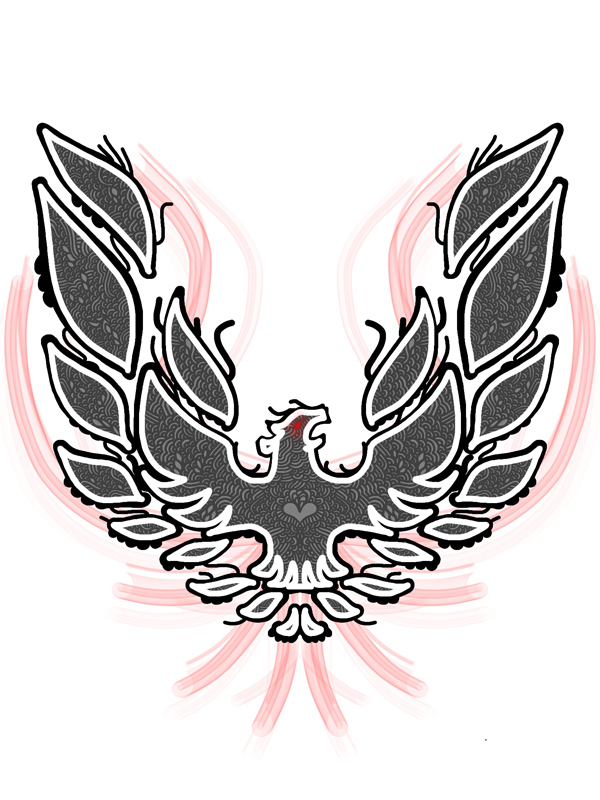 Sometimes it takes me a while to come up with the final concept of an idea, and in this case I decided to appropriate the classic Firebird logo and play around with it. I worked on this concept all night and completed this piece around 4:30am Sunday. I cannot sell this piece for fear of invoking the wrath of the car gods/corporation, so here it is in full glory for free! Aside from sending out another completed character for Coyote and the Stars (which I worked on in my downtime over the weekend), the weekend was very fruitful, even if it did make me not want to go to work on Monday, and sit in front of a computer again. I feel very tanned from all this monitor time.